This is Samar. A 20-year-old girl from Idlib in northern Syria. In 2012, she escaped the war in Syria and fled to safety in Lebanon with her family. She now lives in a tent in an Informal Tented Settlement (ITS) in the Bekaa valley with her parents and five siblings. 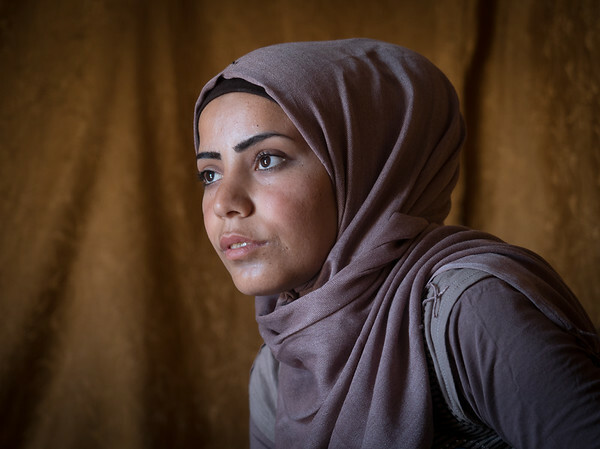 “My family and I left Syria because of the fighting and to save the children and remain alive. I felt sad and it was painful to leave my country, my friends, and relatives”, says Samar. “When I was younger I dreamt of becoming a lawyer but after I fled from Syria this dream was crushed. I am the breadwinner of the family now, so I can't tell them I want to pursue my dream.” Instead of studying in University she is spending six hours a day, six days a week, doing manual labour in agriculture in exchange for living for free on the land of the farmer. Samar and her sister are the breadwinners of the family of eight since her father is unable to work because of his poor health. The main income is from the food allowance from the World Food Programme and also UNHCR CASH programme. So, Samar uses her optimism and drive to make life better for her family and the ones living in her ITS. She is an IFP (information focal point) for NRC. “I help people with hygiene promotion practices, I give them awareness session, and I encourage them that we together should help out to collect garbage to prevent diseases. If a fire breaks out, I put it down. If someone hurt themselves I support with first aid. I check the latrines to make sure they are clean. I give the children hygiene promotion session about how to wash their hands. Also, if parents want to register their children in school I help them. If someone needs to get to the hospital I support them. If someone wants to do birth registration I help them talk to the lawyers,” explains Samar. In addition to this, she also teaches a young girl in the ITS to read and write.